The Sims Blog: Simmers, Get Ready To Patch! The Sims team have just released a brand article showcasing the new features that are coming in tomorrow’s update! The base game has a big update coming! Updates, updates, and more updates for you. 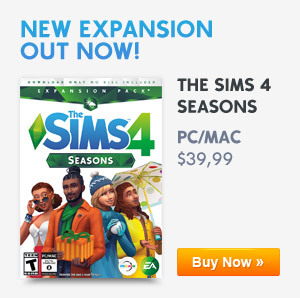 And the best part is, they now come with The Sims™ 4 base game. Read on for more details about this patch*, which will be available tomorrow, November 13, 2018. In case you missed it, check out the livestream that takes you through one of the most manipulative things you can do in the game. When it comes to building, that is! Terrain manipulation will provide more ways for you to be creative, giving you the freedom to build and customize your worlds in unique ways. You’ll be able to expand landscape features and building options, and adjust heights to create hillsides or ditches. Additionally, The Sims 4 will have a “Flatten to Height” tool that combines the functionality of Flatten Terrain with Raise / Lower Terrain at defined foundation increments. A slider or hotkeys can be used to jump to height levels. The Flatten-To-Height tool should display an arrow that auto flips depending if the terrain is going up or down. So, what we’re trying to say is, you can now raise the roof. You’ll also get to choose the name of a Sim’s career, as well as a description of the job that your Sim is performing. Now when other Sims ask what their career is, they won’t reply that their unemployed. Plus, if you ever wanted to see the world through the eyes of your Sims . . .
WE’RE INTRODUCING A FIRST-PERSON CAMERA OPTION! Please excuse the all-caps, but this. Is. Huge. We’re so excited to see how this will change the way you play. Another day, another livestream. But this time, it was introducing the new Style Influencer career! Start as a Rag Reviewer, developing the Writing Skill and interviewing other Sims. Then, advance your Sim by working on Photography and Painting Skills. With new objects, like the digital sketchpad, you can take their career on the go. Your Sim can work from home, write some articles, and slowly but surely, work their way up. In this career, your Sim can become a stylist and makeover other Sims with their own creativity. Once your Sim progresses even further, they can start fashion trends for the entire world! Oh, one more thing, in case you’re looking for some more Get Famous fun. Take the latest quiz, where you can find out how you’ll become famous! Previous ArticleThe Sims Mobile: The Dance Instructor Career Returns!Next ArticleThe Sims Mobile: Harvestfest Event Coming Soon!